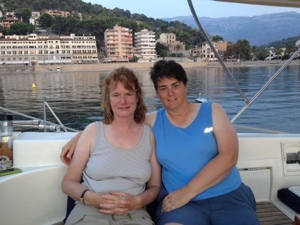 After refuelling at Santa Ponça marina on Thursday we motored around the corner to Sant Elmo in the lee of an offshore island called Dragonera. There are a lot of mooring buoys there to protect the sea grass but we opted to anchor in sand so that Sam and Mags could swim in turquoise waters. 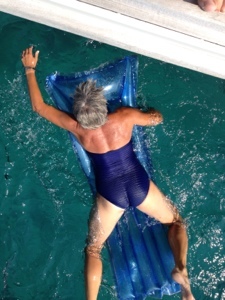 The sea was crystal clear and we had a wonderful afternoon chilling – apart from Liz who decided to clean Nimrod’s waterline floating on a lilo with a scrubbing brush!. Then a BBQ on the back of the boat with homemade burgers and grilled Halloumi. It was a very peaceful evening gently bobbing at anchor. Friday brought some wind so we managed to sail for most of the day until it died around 1600. We popped into Cala Deja, made famous by Robert Graves, but it was very small and looked full by just one large motor yacht so we continued to Soller (pronounced Soya) where there is a marina and a harbour to anchor in. We anchored again, being as poor as church mice, and Mags went to check the anchor but it was too murky so don’t think any of us are swimming in the harbour! 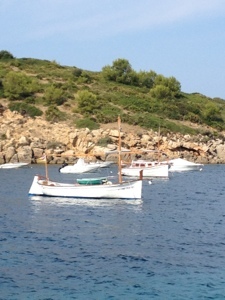 We are planning to spend a couple of days here exploring Soller and Deja before continuing north. Pictures below of Sant Elmo, Liz scrubbing the waterline and Sam and Mags with Soller in the background.